I’ve lived in Wake County for a long time and have witnessed many of the events that have happened here. Heck, I’ve even hosted and organized several of them. But the one event that I find myself recommending to people is High Five. I jotted down several reasons why it’s a fantastic event and here are the top five. Content. I’ve attended marketing, digital and other business events, but High Five is the only one that brings together marketing and creative content. As a digital marketer, I know my strategy is only so good as the creative that supports and aligns to the message. Therefore, I’m always interested in the creative sessions. Also, I love to get in touch with my inner graphic wannabe geek! Intimacy. Yeah, that’s a weird word but it’s so true. Big events have some great aspects but you can easily get lost in the shuffle. Many times I want to say hello to the speaker or even ask them to come to Raleigh to speak at an event and it’s challenging, especially if you want to get to the next session. 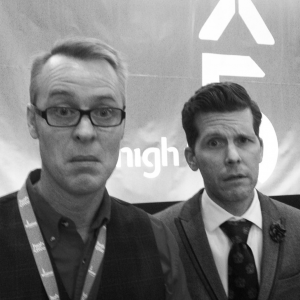 At High Five, I’ve had great interactions and experiences with the keynotes (just hanging with Spike Jones in the photo below), my peers and new connections. Sponsors. I always like to walk the sponsor area to see what shiny piece of swag will catch my eye. Odds are some of my vendors are there and I’ll introduce myself and tell them how much I use their product. The past few years, High Five has had several sponsors that have really surprised me with their creativity. Here’s an example — check out Brand Fuel’s Kindness Container from last year. Community. I love my community. I’ve been fortunate to work with some great professionals and volunteer with some truly awesome folks, both in AMA Triangle and other projects. High Five is one of those events where I get to not only catch up with people I know well in the community, but I also get to build that group with new connections. Fun. If you’re not having fun then why go to an event? From the kick-off to the lunches, cocktail parties and ice cream socials, High Five is the most fun you’ll have in two days in Raleigh, guaranteed! Wrap this all up and you have one heck of a professional development event you won’t forget. But remember, there’s only so many seats at High Five so take advantage of current pricing and grab your seat now!